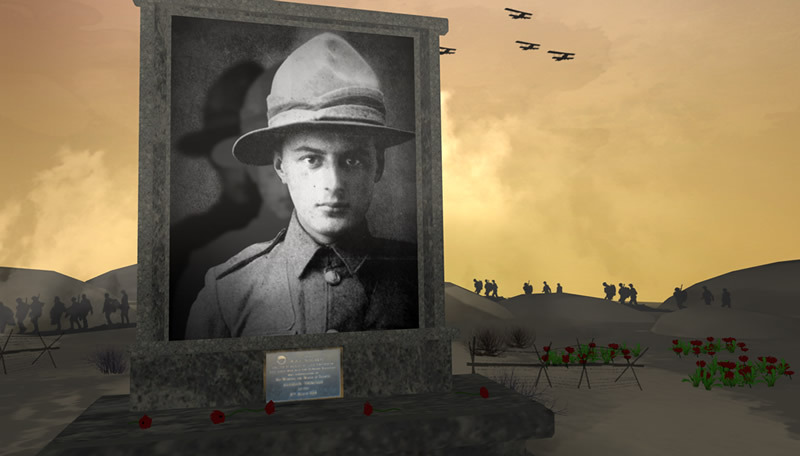 The video for this story about First World War soldiers who were executed screened on TV3 News on 22 April 2015. Private Victor Spencer and Private Jack Braithwaite were two of 28 members of the NZEF sentenced to death during the First World War. Five of these men were sent before the firing squad: Spencer and Braithwaite, Private Frank Hughes, Private John Sweeney, and Private John King. Braithwaite was tried and executed by British military authorities for mutiny while the others were tried and executed by New Zealand authorities for desertion. In total 306 British and Commonwealth soldiers were executed after being convicted in courts-martial during the First World War. In September 2000 all five men received posthumous pardons when the New Zealand Parliament passed the Pardon for Soldiers of the Great War Act. Private Victor Manson Spencer, regimental number 8/2733, was a member of the 1st Battalion, Otago Regiment. He was charged with having committed on 13 August 1917 the offence of desertion; and was, by a Field General Court Martial held on 17 January 1918, convicted of that offence and sentenced to death. He was again sentenced to death on 29 January 1918 after the Field General Court Martial had revised its finding and had convicted him of having committed the offence of desertion not on 13 August 1917 but on 25 August 1917. After the sentence of death imposed on him on 29 January 1918 had been confirmed, he executed by firing squad on 24 February 1918. Victor Spencer was probably suffering from what is now known as Post Traumatic Stress. He was born near Bluff in Southland. Both his parents died young and he was brought up by his aunt Sarah Goomes. He was an apprentice engineer in Bluff and after work, the cox for a local rowing crew. He deserted again and was found two months later with a French woman and her two children. At his court martial an officer who had known him at Gallipoli wrote in Spencer’s defence, ‘The accused was a good soldier while he was with me. I had no fault to find with him.’ In spite of the good word Victor Spencer, aged 21, who had been with the Expeditionary Force for almost three years, was shot at dawn on February 24th 1918. Braithwaite was born at Dunedin in 1885, one of at least 16 children of bookseller Joseph Braithwaite and his wife, Mary Ann Bellet. Educated at Arthur Street School, he worked with his father until about 1911, after which he became a self-described ‘Bohemian Journalist’, possibly living in Sydney for a period. He volunteered for the NZEF in May 1915 – a decision almost certainly influenced by news his younger brother, Horace, had been seriously wounded at Gallipoli. After training at Trentham Military Camp, he sailed for Egypt aboard the Tahiti on 8 January 1916, arriving at Suez a month later. Posted to 2nd Battalion, The Otago Regiment, Braithwaite was promoted to the rank of lance corporal just before his unit sailed for France in early April 1916. Braithwaite’s performance deteriorated badly in France. He lost his lance corporal stripe in May 1916 for being absent without leave charge and from this point on ‘let duty and soldiering go to hell’. On 13 June 1916, he appeared before a New Zealand Field General Court Martial on three charges: for being absent without leave, stating a falsehood to an officer, and using a false leave pass. The court found him guilty on all charges and sentenced Braithwaite to 60 days’ Field Punishment No. 2. His situation worsened on 7 July when a court martial sentenced him to two years’ hard labour for missing roll call and escaping confinement – a punishment repeated after Braithwaite escaped again while being transferred to the British Army’s Blargies North military prison, near Abancourt. He pleaded guilty at the court martial on 19 July, and incarcerated in Blargies North prison twelve days later. On 28 August 1916, Braithwaite was involved in an incident at Blargies where an Australian prisoner swore at, and resisted arrest by a military policeman. A crowd of Australian and New Zealand prisoners gathered round the pair, shouting and jeering. At the same time, Braithwaite, who was mess orderly, tried to give the prisoner his lunch. As the commotion developed, he made the fatal mistake of leading the prisoner away to his tent, in order, he claimed, to defuse the situation. This conspicuous action led to his being singled out by prison authorities for punishment as one of the incident’s main offenders. Braithwaite appeared before a court martial on 11 October 1916, charged along with three Australians with mutiny. He put forward a credible defence, stating that he had acted to calm an inflammatory situation. While defence witnesses corroborated his version of events, authorities found Braithwaite guilty and sentenced him to death. In passing such severe judgement, the court almost certainly wanted to send a message to the Australian and New Zealand prisoners, whose treatment had already caused problems at Blargies. At the heart of the issue lay the animosity between the Anzac prisoners and the British military police – the hated ‘red caps’. Of the four convicted mutineers, only Braithwaite faced the firing squad. The three Australians had their death sentences commuted to two years’ hard labour because Australian legislation prohibited executions without governmental approval. The New Zealand government had insisted upon no such reservation, and Commander-in-Chief, General Sir Douglas Haig, confirmed Braithwaite’s sentence on 25 October 1916. The disciplinary problems at the prison, and Braithwaite’s poor service record sealed his fate at general headquarters. Under the NZEF’s terms of service, there was no requirement a New Zealand officer to review the case. Nor did Braithwaite have any practical avenue of appeal against his sentence, which he learned of on 28 October. At 6.05 a.m. on 29 October 1916, Braithwaite was shot by a firing squad at Rouen. He was buried at St. Sever Cemetery Extension, on the outskirts of the city. Aware of the sensitive nature of the case, the military authorities in New Zealand kept the details of Braithwaite’s death confidential. Although Labour Party leader, Harry Holland, briefly raised the matter in Parliament in 1919, the execution did not arouse any public feeling at the time. Not until the mid-1980s did it become a matter of controversy, especially as a reflection of the growing interest in Britain in the more than 300 British soldiers executed during the First World War. In 2000, Braithwaite and the other four executed NZEF soldiers received posthumous pardons when the New Zealand Parliament passed the Pardon for Soldiers of the Great War Act. There are no birth records for John Braithwaite. DNZB research suggests his father probably registered him as Cecil James (born on 3 January 1885). 8/813 Pte Horace Braithwaite, Otago Battalion, WIA 25 April 1915. Invalided to New Zealand on the Willochra and died of wounds at Dunedin hospital, 15 January 1916. Two other brothers – 8/646 Pte Neville Douglas Braithwaite and 70955 Pte John Rewi Fergusson Braithwaite – also served with the NZEF. Braithwaite was absent without leave, 30-31 May 1916. He went drinking in a British soldier’s billet, and when asked for his leave pass fabricated a story about being involved in espionage work. There were two types of field punishment used by the British armies in France – Field Punishment No. 1 and Field Punishment No. 2. Field Punishment No. 1 saw soldiers chained or roped to a wall or post for two hours a day, as well as enduring the additional restrictions of Field Punishment No. 2. FP No. 2 involved pack drill, menial duties, and loss of leave privileges. Braithwaite escaped on 10 July 1916 while being transferred from the 2nd Otago Battalion guardroom to the divisional field punishment compound. He disappeared after asking to use the toilet, slipping away from his guard in an estaminet [café]. He was arrested in Armentières two days later. The Australian prisoner, Private Alexander Little, told a military policeman to ‘Go and f*** yourself’ after the hot water ran out while he was having a shower. Little was arrested, and as he was about to be put in the punishment compound by the arresting staff sergeant, he resisted. A mutiny, involving Scottish prisoners, had occurred at the prison on 14 August 1916. Six men were sentenced to death, one of whom – Gunner William Lewis – was executed the same day as Braithwaite. In their defence, the prisoners argued that the Australians seemed to get preferential treatment. Australian Imperial Force (AIF) personnel served under the terms of the 1903 Australian Defence Act, which prohibited the application of the death penalty by courts martial until confirmed by the Australian Governor-General. See also the Executed Five set on Digital New Zealand for images and other digitised material. Images, historic video and further sources: Archives New Zealand and National Library of New Zealand.